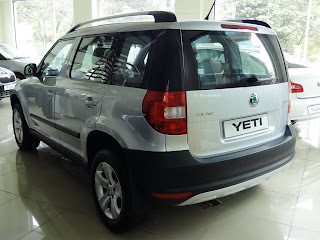 A few days back I got a call from My dealer that the New Skoda Yeti has come down to Bangalore. 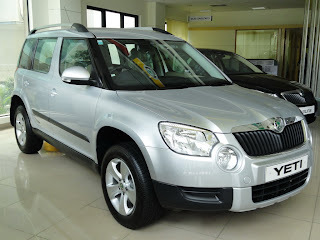 I had seen the Skoda Yeti video during my earlier visit to the dealership and was eager to check it out. Since the Skoda dealership comes on my way back home, I made a point to check it out. From far Skoda Yeti looks like Nissan X Trail, but from near, it looks really unique. The first eye catcher is the front headlamps, which just stands out of from the rest of the lot. Just like other Skoda models the front grill is impressive and looks similar to other Skoda models. From the outside the Skoda Yeti looks compact, but from the inside the space is quite good. Its a 5 seater SUV and the rear has been designed just to keep the luggage. Skoda Yeti looks more like a city driving SUV due to its compact shape and would help to drive easily in city traffic and also I feel it would be easier to get parking space in city. Other than the front headlamps and simple roof railings the exterior is pretty simple. 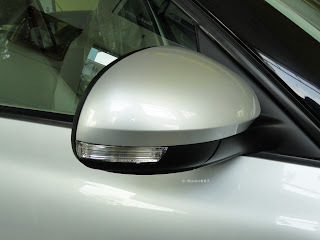 The rear view mirrors with indicators looks good. Overall nothing much to say on the exteriors. Coming to the interior the dashboard looks like any other European vehicles simple and neat. Just like any other Skoda models the fit and finish of the interior is just too good. Very neatly done. But nothing jazzy or mind blowing as such for the price, was expecting more and innovative things. Coming to the test drive, Yeti is powered with a 1968 CC Diesel Engine and gives a max power of 140BHP at 4200 RPM. The torque is 320 Nm @ 2500 RPM. But if you are looking at driving comfort like me without much breaking head on the numbers, in short its a comfortable SUV to drive. I liked the visibility of the Yeti, which is much better than my Fabia. Like any European vehicles the pickups are slower in the beginning , but once you hit the 3rd or 4th gear you actually come to feel the power. And guess what Yeti comes with 6 Gears , and its a all time drive 4X4 version. Took a short drive in the Bangalore city traffic, it was very comfortable to drive. But it doesn't make you feel that you are driving a SUV, I felt driving Yeti was easier than driving my Fabia. While driving my Fabia it gives a feel of driving a mini tank, but driving a Yeti did not give me a feel of a solid built drive which you typically expect in a SUV. So what's really unique in Yeti is its off road driving capabilities. It has some unique features like Hill Decent Control , Off road Traction control and Drive off Assistance, these features are mainly used in extreme off road conditions. So if you are looking at some adventure in the wild country side, you can drive off the Yeti to the nearest Off highway roads to experience its true capabilities. Also I liked the feature of Hill Hold control, wherein the Yeti can stand still while climbing up the hill even though you have left the brakes. So no need to worry on the clutch and brake timing. Yeti would not go backwards . 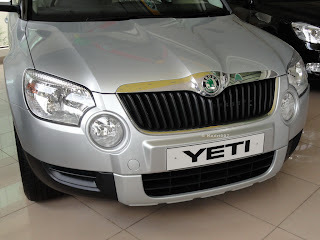 Though I have not tried Off roading with Yeti so cannot comment much on its actual performance. Coming to the Safety aspects, Skoda Yeti comes with six air bags and has got ABS. But compared to the Fabia or Laura the Yeti doesn't give you a feel of a solid built vehicle. Looks like Skoda has changed its strategy to make the vehicle light weight and become more fuel efficient. The negative things about the Yeti is its simple looks for the price being charged. Also since its a imported unit , its spares would be costlier. But for people who are looking mainly for city drive and a bit of off roading or driving in village road conditions. Skoda Yeti would be one of the Compact SUV's to be considered while doing the SUV hunt.